The Madrid Safari Park houses approximately 500 animals. There is a daily lion taming show. The city is located on the southern Meseta Central, 60 km (37 mi) south of the Guadarrama mountains and straddling the Jarama and Manzanares river basins. Since the early 1990s the population in the city of Madrid has grown by more than two million residents. As of April 2018, the population of Madrid is about 3.2 million people. Madrid has its own version of Disney World, called Warner Brothers Movie World. Madrid has a bullfighting museum called Museo Taurino. It contains history about the sport, dress, and insight into the sport itself. Madrid has a total area of 604 square kilometers (233 square miles). The official symbol of Madrid is a bear standing on its hind legs eating berries from a tree. This is meant to represent the growth of Madrid and ownership and possession of wood (required for building). There is a considerable difference in altitude within city limits ranging from 543 meters (1,781 feet) to 846 meters (2,776 feet) above sea level. The documented history of Madrid dates to the 9th century, even though the area has been inhabited since the Stone Age. The development of Madrid as a city began when Philip II moved his court there from Toledo in the 1560s. Taxi drivers in Madrid tend to disappear when it starts to rain. They don't have much faith in their vehicle's ability to protect passengers from the rain. Madrid experiences roughly 17 inches of rain a year. 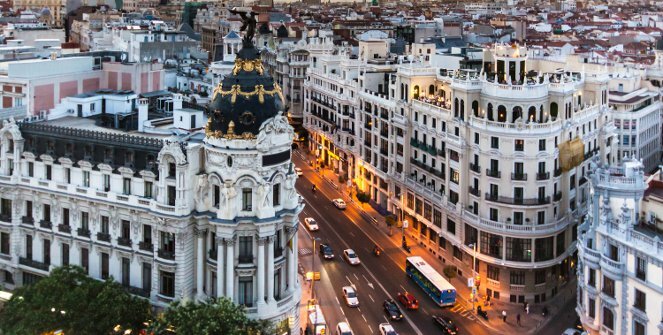 Madrid has been the country’s capital continuously since 1606. In most of Spain there is an afternoon siesta. They may open at 9am and then close at 1pm for the siesta, and then open again at 5pm. Madrid is a city of contrasting styles, reflecting clearly the different periods in which change and development took place. The old center, a maze of small streets around a few squares in the vicinity of the imposing Plaza Mayor, contrasts with the stately Neoclassical buildings and grand boulevards created by the most eminent architects of their day. Modern office buildings in the center and swaths of apartment blocks around the outskirts attest to the styles and economic realities of present-day development. Madrid's airport Madrid-Barajas Airport is the world's 10th busiest airport, and is the busiest in Spain. The Plaza Mayor was first built (1580–1619) during Philip III’s reign and is a central plaza in the city of Madrid. The Plaza Mayor is rectangular in shape, measuring 129 × 94 meters (423 × 308 feet), and is surrounded by three-story residential buildings having 237 balconies facing the Plaza. It has a total of nine entrance ways. The Casa de la Panadería (Bakery House), serving municipal and cultural functions, dominates the Plaza Mayor. Madrid has fewer cloudy days than most cities in Europe. A truly world-class museum, the Prado Museum has a collection of more than 5,000 paintings that rivals the Louvre collection in Paris. Spanish paintings from the 12th century to the early 19th century form the majority of the collection, and many are famous masterpieces. The assortment of paintings by Francisco de Goya includes a remarkable 140 works. The collection also covers Italian, Flemish, French, British, and German paintings as well as Neoclassical Italian sculptures. Madrid is home to three art galleries including the Prado, the Museo Thyssen-Bornemisza, and the Museo Nacional Centro de Arte Reina Sofia. These three museums are called the Golden Triangle of Art because they are located very close to each other. The Royal Palace of Madrid is the official residence of the Spanish Royal Family at the city of Madrid, but it is only used for state ceremonies. King Felipe VI and the Royal Family do not reside in the palace, choosing instead the more modest Palace of Zarzuela on the outskirts of Madrid. Madrid's football stadium is Bernabeu and it can hold as many as 85,000 spectators. FIFA ranks Madrid as having the 20th century's most successful football (soccer in the U.S.) club. The team is Real Madrid FC. The Buen Retiro Park is one of the largest parks of the city of Madrid, Spain. The park belonged to the Spanish Monarchy until the late 19th century, when it became a public park. It is a large and popular 1.4 square kilometers (350 acres) park at the edge of the city centre. While the city of Madrid has approximately 3.14 million residents, the metropolitan area of Madrid has more than 6.7 million residents in total. The Puerta del Sol is a public square in Madrid, one of the best known and busiest places in the city. This is the centre (Km 0) of the radial network of Spanish roads. The square also contains the famous clock whose bells mark the traditional eating of the Twelve Grapes and the beginning of a new year. The New Year’s celebration has been broadcast live on national television since 31 December 1962. Madrid is divided into 21 districts. These districts are then further divided in wards. In total there are 128 wards in Madrid. The Puerta de Alcalá is a Neo-classical monument in the Plaza de la Independencia in Madrid. It is regarded as the first modern post-Roman triumphal arch built in Europe, older than the similar monuments Arc de Triomphe in Paris and Brandenburg Gate in Berlin. At 650 meters above sea level Madrid is Europe's highest capital city. Madrid's name is derived from the Arabic word 'magerit' which translates to mean a 'place of many streams'. Madrid is the European city with the highest number of trees and green surface per inhabitant and it has the second highest number of aligned trees in the world, with 248,000 units, only exceeded by Tokyo. Madrid's citizens are referred to as Gatos. There is a legend that tells a story of a soldier in Madrid who avoided Arabic invasion by scaling the walls to escape, like a cat. Gatos means cats. The city is considered one of the top European destinations concerning art museums. Madrid has been one of the great centers of Spanish literature. Madrid is a popular tourist destination, with more than 7 million visitors each year. The nightlife in Madrid is one of the city’s main attractions. Tapas bars, cocktail bars, clubs, jazz lounges, live music venues, flamenco theatres, and establishments of all kinds cater to all. Madrid hosts the largest plaza de toros (bullring) in Spain, Las Ventas, established in 1929. Las Ventas is considered by many to be the world centre of bullfighting and has a seating capacity of almost 25,000. Madrid’s bullfighting season begins in March and ends in October. Madrid is home to La Liga football club giant Real Madrid, who play their home games at the Santiago Bernabéu. Founded on 6 March 1902 as Madrid Football Club, the club has traditionally worn a white home kit since inception.